Being Retro: On the Fraggle Rock... and Midnight Movie: The Killer Cut! On the Fraggle Rock... and Midnight Movie: The Killer Cut! Hope everyone had a great weekend, with the weather and the blogger updates that happened over the last several days I gave up. Seems my internet was down due to the weather and on return I couldn't get into my emails or blog, only to find out about the blogger being serviced. I thought it was me and that I had the problem and technically I did, but I just gave up and watched a bunch of dvd's of Smallville. Okay I am getting ahead of myself but, if you go to "http://twothumbseightfingers.blogspot.com/" my other site you can read the previous interviews [look under goodies on the right]. I also very sorry about not visiting many of my favorite blogs/web sites, but I am being attacked by time and time is winning. Everyday I come closer to exploding and I need to better prioritize my list of things. May Monday bring you less Mayhem! Just in case you didn't know, Jim Henson is my Lord and Saviour. 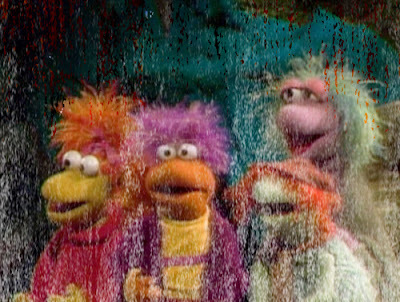 I LOVE the Fraggles!!!! !